Your fragrance fantasies are twice as nice with this dual-ended rollerball and full sized Bowdacious bottle set! Ingredients: VIVA LA JUICY EAU DE PARFUM ROLLERBALL / ROLL-ON INGREDIENTS: ALCOHOL DENAT., PARFUM/FRAGRANCE, WATER/AQUA/EAU, BUTYLPHENYL METHYLPROPIONAL, PROPYLENE GLYCOL, BENZYL BENZOATE, BENZYL SALICYLATE, COUMARIN, HYDROXYCITRONELLAL, HYDROXYISOHEXYL 3-CYCLOHEXENE CARBOXALDEHYDE, LIMONENE, LINALOOL, BUTYL METHOXYDIBENZOYLMETHANE, BLUE 1 (CI 42090), RED 4 (CI 14700), YELLOW 5 (CI 19140). VIVA LA JUICY BOWDACIOUS EAU DE PARFUM ROLLERBALL / ROLL-ON INGREDIENTS: ALCOHOL DENAT., PARFUM (FRAGRANCE), AQUA/WATER/EAU, BUTYL METHOXYDIBENZOYLMETHANE PROPYLENE GLYCOL, TRIS(TETRAMETHYLHYDROXYPIPERIDINOL CITRATE, BENZYL SALICYLATE, COUMARIN, HYDROXYCITRONELLAL, LIMONENE LINALOOL, EXT. VIOLET 2 (CI 60730), RED 33 (CI 17200), RED 4 (CI 14700). Ingredients: INGREDIENTS: ALCOHOL DENAT., PARFUM (FRAGRANCE), AQUA/WATER/EAU, BUTYL METHOXYDIBENZOYLMETHANE, PROPYLENE GLYCOL, TRIS(TETRAMETHYLHYDROXYPIPERIDINOL) CITRATE, BENZYL SALICYLATE, COUMARIN, HYDROXYCITRONELLAL, LIMONENE, LINALOOL, EXT. VIOLET 2 (CI 60730), RED 33 (CI 17200), RED 4 (CI 14700). Another fabulous fragrance from juicy! I like it so much that I went and bought a second bottle. The smell is very different than the others. I love it. 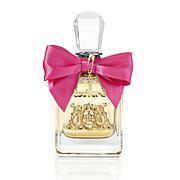 Another fabulous scent from Juicy Couture! Flirty and fun for any age! Love the scent and packaging of this fragrance... the to-go rollerball is perfect for sticking in my purse! What a pretty bottle and the fragrance is just wonderful! I love all the Viva fragrances but this one is pretty special. Juicy always seems to get it right! This scent is one of my favorites -- great for day or a night out. And I love this packaging; its the perfect set for gifting or to display on my dresser! 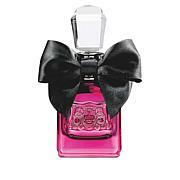 Immerse yourself in the world of Juicy Couture. From flirty fragrances to fashionable timepieces, Juicy provides the perfect finishing element to any look. Whether you love light and fruity, rich and earthy or delicate floral scents, you’ll find the perfect fragrance from Juicy Couture. The Juicy timepiece collection includes a mix of sport and dress watches that are fun as well as classic and sophisticated. Put it all together to complete your casual chic aesthetic.